I so can't wait to read this one! I absolutely LOVE Maria's work, as you may know by now! This is going to be her new adult trilogy and I really really REALLY want to read it already!! Maria is my all-time--and probably only--favorite fantasy author! Her fantasies are so amazing and incredible, I just can't explain why I get so sucked into the worlds she creates, I just do! Of course Janco was a big part of my love of the Study and Glass trilogy! And Valek's a given!! Oh, wow . . . this sounds great! I've never read any of Maria's work, but this may just be my first. Oh, wow, that is pretty! I've never heard of this, or read any of her books, but I love the sound of it! It sounds great and has a beautiful cover. Here's my Waiting on Wednesday. Hey, Jessica. Love the new layout! This sounds like an awesome read. Good choice! I am going to have to check some of her stuff out. I haven't read any of it before. Great Choice. I haven't read anything by this author before but hearing that she is your fave fantasy author - I must check her out!! the cover of this novel is gorgeous. i love the pinks and purples. i've never read a maria snyder book and i think it's time i do. please check out my WoW pick this week. Sounds like a great read! The cover is gorgeous btw. I am definetley checking this author out. I've heard so many good things about this author and I still haven't read her. :/ This book sounds really good. 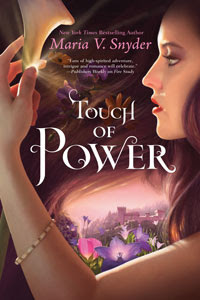 And the cover is gorgeous! oh this seems awesome!! Can't wait to check it out!! I LOVE this cover. I actually saw someone at school today reading one of her books! And this sounds great. I'll add this one to my TBR! Gah! The cover for this is SO pretty! I've always wanted to read something Maria Snyder... I hope it's great! I've been seeing this one around a lot. I will have to check it out. LOL. Great minds think alike! Nancy Holder and Debbie Viguie Signing! !